Harry Dean Stanton is an American actor, musician, and singer. Stanton's career has spanned over fifty years, which has seen him star in such films as Paris, Texas, Kelly's Heroes, Dillinger, Alien, Repo Man, Pretty In Pink, The Last Temptation of Christ, Wild at Heart, The Green Mile and The Pledge. In the late 2000s, he played a recurring role in the HBO television series Big Love. Stanton was born in West Irvine, Kentucky, the son of Ersel (née Moberly), a hair dresser, and Sheridan Harry Stanton, a tobacco farmer and barber. His parents divorced when Stanton was in high school and later remarried. He has two younger brothers, Archie and Ralph, and a younger half-brother, Stan. Stanton attended the University of Kentucky in Lexington, Kentucky, where he studied journalism and radio arts. He also studied at the Pasadena Playhouse in Pasadena, California, where his classmates included his friends Tyler MacDuff and Dana Andrews. Stanton is a US Navy veteran of World War II. He served as a cook aboard an LST during the Battle of Okinawa. Stanton has appeared in both indie and cult films (Two-Lane Blacktop, Cockfighter, Escape from New York, Repo Man), as well as many mainstream Hollywood productions, including Cool Hand Luke, The Godfather Part II, Alien, Red Dawn, Pretty in Pink, Stephen King's Christine and The Green Mile. He has been a favorite actor of Sam Peckinpah, John Milius, David Lynch, and Monte Hellman, and is also close friends with Francis Ford Coppola. He appears as a complaining BAR Man in the very beginning of the Gregory Peck film Pork Chop Hill in 1959. He had a very small part in 1962's How The West Was Won as one of Charlie Gant's gang. His breakthrough part came with the lead role in director Wim Wenders' film Paris, Texas . Playwright Sam Shepard, the movie's screenwriter had spotted Stanton at a Santa Fe, New Mexico, bar in 1983 while both were attending a film festival in that city, and the two fell into conversation. "I was telling him I was sick of the roles I was playing," Stanton recalled in a 1986 interviews. "I told him I wanted to play something of some beauty or sensitivity. I had no inkling he was considering me for the lead in his movie." Not long afterward, Shepard phoned him in Los Angeles to offer Stanton the part of protagonist Travis, "a role that called for the actor to remain largely silent ... as a lost, broken soul trying put his life back together and reunite with his estranged family after having vanished years earlier." Stanton is a favorite of film critic Roger Ebert who has said that "no movie featuring either Harry Dean Stanton or M. Emmet Walsh in a supporting role can be altogether bad." However, Ebert later admitted that Dream a Little Dream , in which Stanton appeared, was a "clear violation" of this rule. His television credits are extensive, including eight appearances between 1958 and 1968 on CBS' Gunsmoke and four on the network's Rawhide, as well as a cameo as himself on Two and a Half Men , and alongside Sean Penn and Elvis Costello. He has been featured since 2006 as Roman Grant, the manipulative leader/prophet of a polygamous sect in the HBO television series Big Love. Stanton has also occasionally toured nightclubs as a singer/guitarist, playing mostly country-inflected cover tunes. He appeared in the Dwight Yoakam music video for "Sorry You Asked", portrayed a cantina owner in a Ry Cooder video for "Get Rhythm", participated in the video for Bob Dylan's "Dreamin' of You", and in 2003, appeared in the video for "Stop" by Black Rebel Motorcycle Club in 2003. During 2010, he appeared on the NBC show Chuck for one episode, reprising his role as a repo man from the 1984 cult film Repo Man. In 2011, the Lexington Film League created a festival to honor Stanton in the city where he spent much of his adolescence. 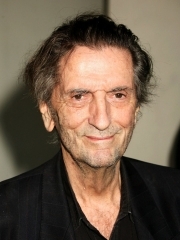 [http://www.kentucky.com/2011/01/30/1616646/lexington-film-festival-honors.html] The first annual Harry Dean Stanton Fest was three days of film screenings including "Paris, Texas", "Repo Man", "Cool Hand Luke", and the premiere of a PBS documentary by director Tom Thurman entitled "Harry Dean Stanton: Crossing Mulholland". All screenings were held at the historic Kentucky Theater . Hunter Carson, Stanton's co-star in "Paris, Texas", attended the festival and conducted a Q&A following the film. The second annual Harry Dean Stanton Fest is scheduled for May of 2012 in downtown Lexington, KY. Whole or part of the information contained in this card come from the Wikipedia article "Harry Dean Stanton", licensed under CC-BY-SA full list of contributors here.